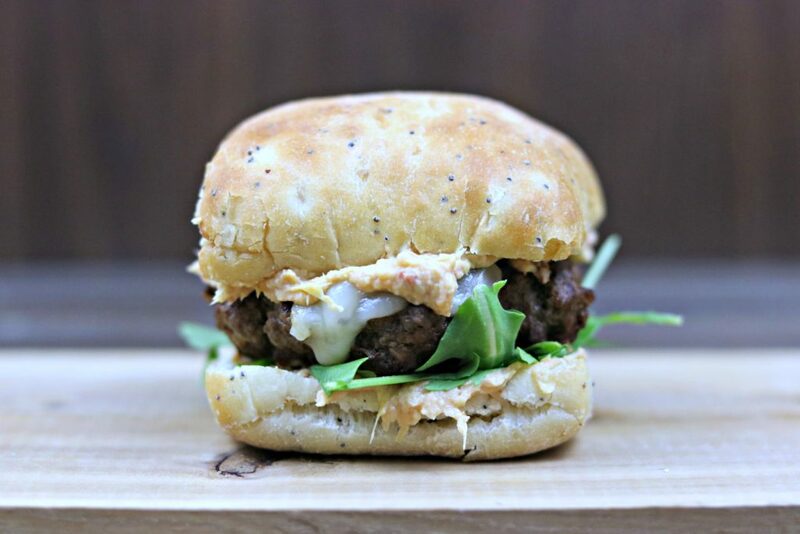 Elevate your standard burger by adding creamy brie and a sun dried tomato and artichoke spread! Sammich Saturday has returned! Don’t call it a comeback. Or you can if you want. You guys. This burger. OMG. Now, it’s no secret that I am a lover of pretty much all things sandwich (hello, Sammich Saturday) – including burgers. I LOVE a good burger. 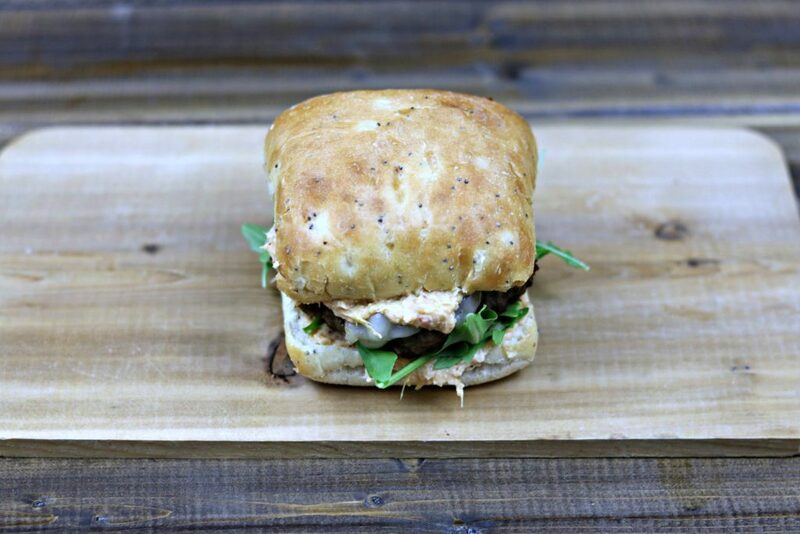 And this burger – is just out-of-this-world, good. 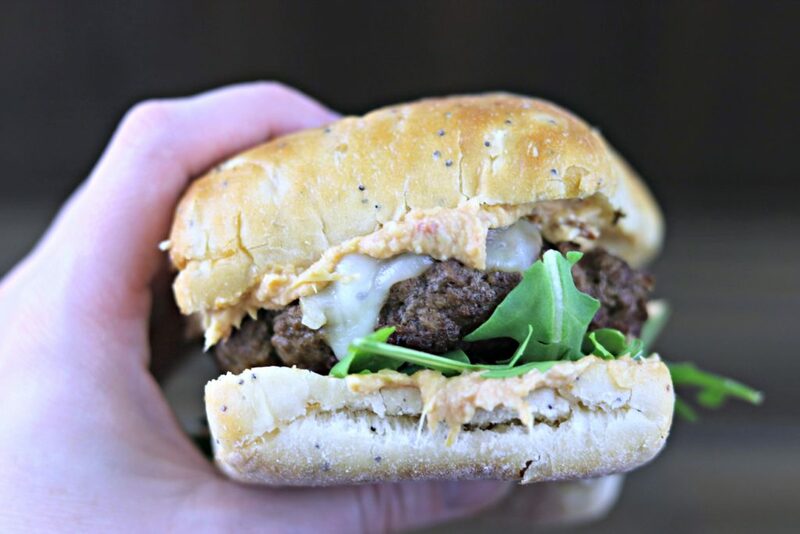 You have your burger patty, which is great in it’s own right, but then you top it with creamy, melty brie and surround it with a creamy sun dried tomato and artichoke spread, on a bed of crisp arugula, and – WHAT?!? And if that isn’t enough deliciousness for you, I also made ours using onion poppyseed ciabatta rolls. I know. Outta control. J is a big sun dried tomato fan, so I figured this would be right up his alley. He likes to tease me about the “fancy” food I make sometimes, but I sure don’t hear any complaints when he’s scarfing it down! Just look at that burger – makes you wanna take a big bite right now, doesn’t it?? 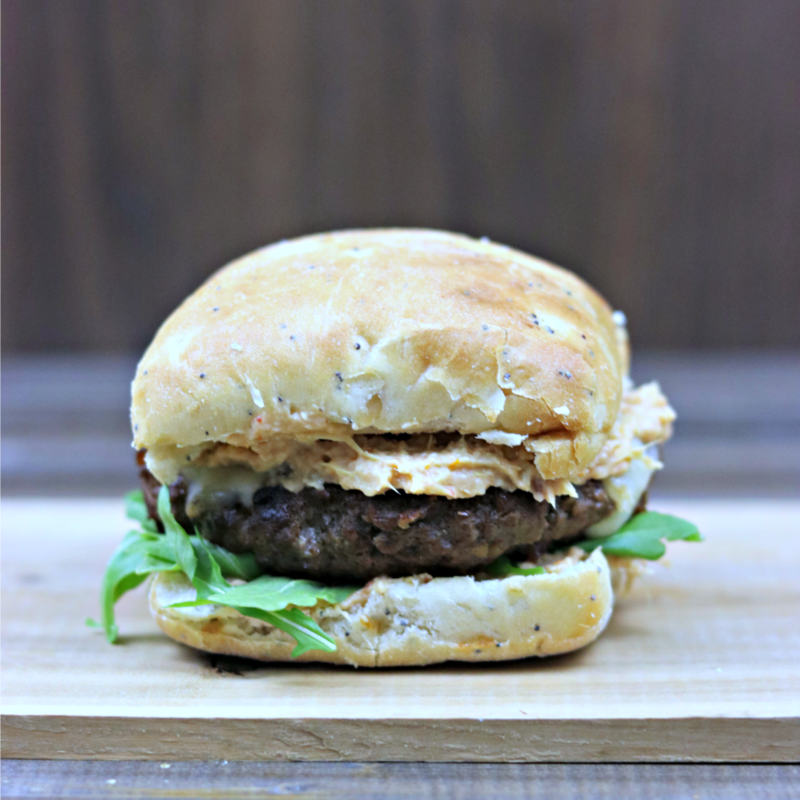 You can make this burger with your preferred type of meat, but of course we used venison. Because…freezer full, and we love it! But beef would be equally as good and ground turkey or chicken could also be used. That’s one of the things I love so much about burgers and sandwiches – they are so easily customizable to fit individual taste! I wish I had one of these burgers in front of me right now. Nom nom nom. 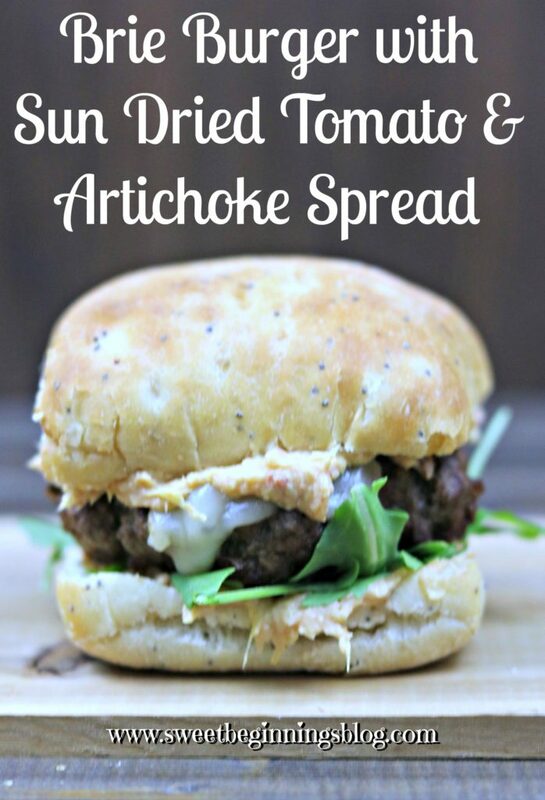 Combine the artichokes, sun-dried tomatoes, mayo and 1 teaspoon of garlic in a blender or food processor. Pulse to chop roughly and combine. If you like a smoother spread, continue to blend until smooth. Season to taste with salt and pepper. Cover and refrigerate until needed. In a large bowl, combine the ground beef, the remaining tablespoon of garlic and the chopped shallots. Season with salt and pepper, then mix lightly. Shape mixture into 4 equal-sized patties. Heat oil in a large skillet over medium-high heat. Place the patties in the skillet, and cook until browned on both sides and cooked to your desired doneness, about 5-6 minutes, flipping once. Top each patty with the cheese during last 2 minutes of cooking. To assemble – Toast your buns if you like, then spread some of the spread on the bottom bun. 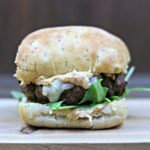 Top with arugula, then a patty. Spread more of the spread on the top bun, then place on top of the burger. Enjoy! !